Reproduction Fabrics - deep discount on fabric closeouts > fabric line: SUPER DEALS! > deep discount on fabric closeouts > SUPER DEALS! This is our area of deep discounts, reduced 30-50%! You've seen these before on our website, but now they are cheap, cheap, cheap! Get these while they last (at these prices they will be going, ...going, ...gone!). Minimum 1 yd of any sale/closeout fabric. 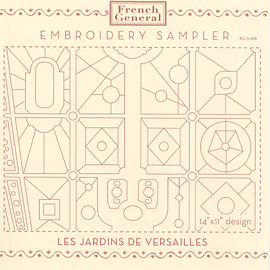 Embroidery Sampler 14" X 11" design...printed on dove gray linen.